“Take deep breaths, in through your nose, out through your mouth,” our San Juan Outdoor Adventures Guide, Chris Murray, is coaching me as I stand frozen and shaking, clipped into a cliffside hundreds of feet off the ground. I knew that Telluride’s Via Ferrata would be unnerving, but now that I’m actually standing on stainless steel bars drilled into the mountainside with a perilous drop below me, the fear is real. reaction to being up here, but heights are my kryptonite. Glass elevators are panic-inducing and visiting the Empire State Building’s Observation Deck felt more like a terror ride than a tourist trap. Here in Telluride, Colorado on the side of towering Ajax Peak, my senses beg me to go back to the somewhat safe rock ledge behind us. But that’s not what I came here to do. Plus, I’m sandwiched between my guide and my friend Rachel—so barring a helicopter rescue—I’m stuck. And helicopter rescues are not within a writer’s budget. Via Ferrata means ‘Iron Road’ in Italian, and it describes the fixed climbing routes equipped with cables, ladders, and metal holds originally built during World War I in the Dolomite Mountains to aid the movement of troops through once impassable terrain. Today, these routes are climbed for fun—not transportation—and though they’ve long been popular in Europe, they’re still a new pursuit in the United States. Expert climber and metalworker, Chuck Kroger, loved European Via Ferratas so much that he decided to build one in his longtime home of Telluride. He forged the metal holds in his workshop and installed them on the wall below Ajax Peak at the end of the box canyon, working at night since the endeavor wasn’t exactly legal. 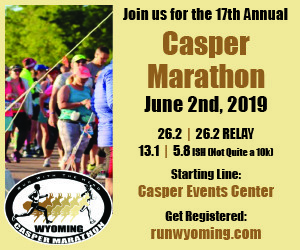 Unfortunately, Kroger passed away before he could finish the route, but others completed it, nicknaming it the Krogerata and placing a memorial bench and plaque there in his honor. Wonder why you haven’t heard of this Via Ferrata before? 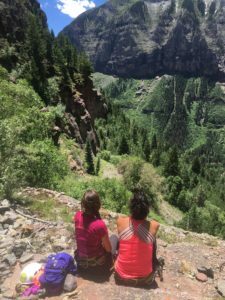 Truly, it was a local’s secret until recent years, but the U.S. Forest Service acknowledging the route and providing permits to guides has turned it into a popular tourist destination, and a rite of passage for Telluridians. 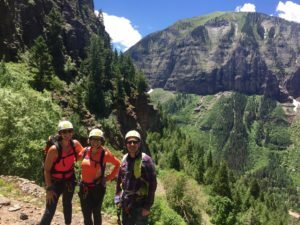 My paralyzing fear is not an atypical emotion atop Telluride’s Via Ferrata, especially the aptly named section we find ourselves on—The Main Event. But what you do with that fear matters; I decide to be dareful. 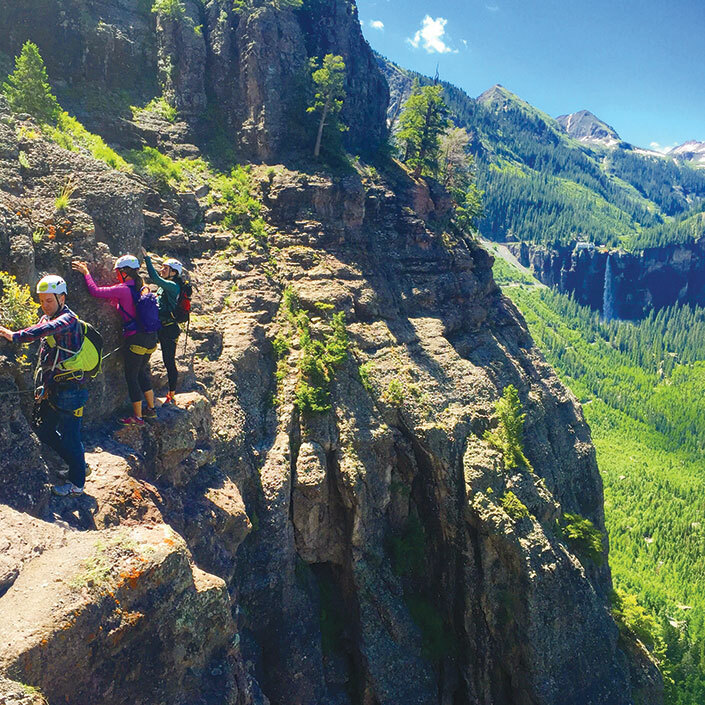 With Rachel and Chris coaching me, I traverse a cliff typically accessible only to expert climbers using metal edges, and my bravery is rewarded with stunning views of Bridal Veil Falls, Colorado’s tallest waterfall. When I reach the rock ledge—without having fallen—I’m shaking, smiling, and ready to Instagram the heck out of it. See? Even acrophobes can learn new tricks. Despite my fears, courage is the only real skill needed to climb the Via Ferrata. More extreme hiking than climbing, it’s built on old mining trails along the face of the 12,758-foot peak. Once you get the hang of clipping, sliding, and stepping, navigating the wall’s twists and turns is a thrill. Lunch break after completing the Via Ferrata. Those with no climbing know-how (two members of our party had never been) can do it. Those extremely afraid of heights like me need not apply—unless you’re as determined to conquer your fear as I am. 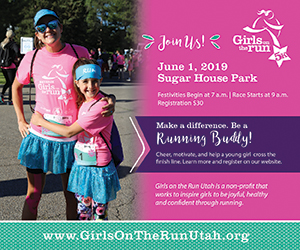 After The Main Event you can turn back and make it a half day, but continuing offers more challenging terrain to climb, no crowds, stellar views of town, and the accomplishment of hiking four miles on the side of a mountain. 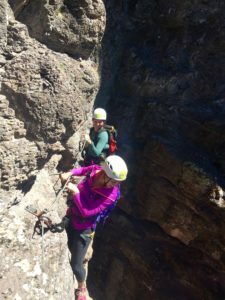 Though I’m experienced in the outdoors, an expert at cliffside safety and survival I’m not, which is why we climbed with San Juan Outdoor Adventures. 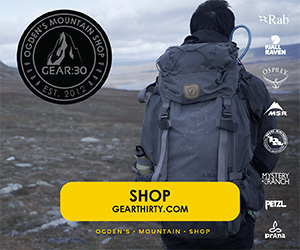 They use only American Mountain Guide Association certified guides and are known for their perfect (knock on wood) safety record. 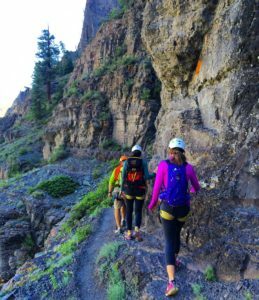 Our guide, Chris, brought along his safety smarts, a fun attitude, and Via Ferrata-specific gear that won’t break when you fall (other climbing gear offers false security on routes like these). Chris also showed us ways to avoid serious falls in tricky spots, how to clip correctly, and talked me down from hyperventilating on The Main Event. 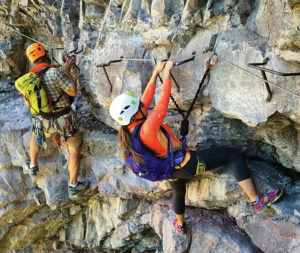 This route doesn’t feel dangerous at times, but the deadly consequences of slipping make hiring a guide worthwhile—and surprisingly affordable. Stand up paddleboarding at Alta Lakes. Even a whole day on the Via Ferrata means you’re done by 2:00, leaving you with an entire sunny afternoon to relax on the water. 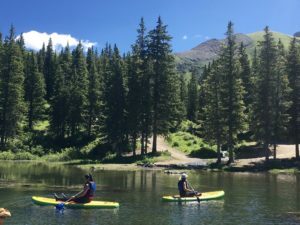 Kayak, raft, or float the many waterways, or do a twofer like us: stand up paddleboard on an alpine lake and tube the San Miguel River. 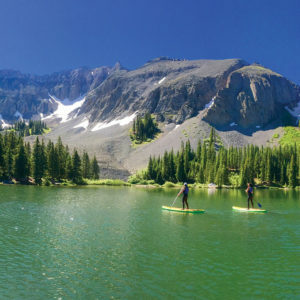 The guides at Bootdoctors took us to SUP at a local secret spot, Alta Lakes, where turquoise waters are surrounded by Telluride’s iconic 12,000-ft+ snowy peaks. 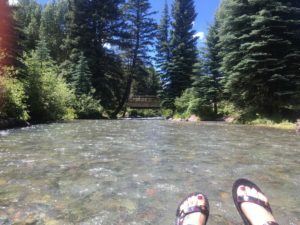 waters, watched local fishermen catch trout, and visited the eerie ruins of a nearby gold mining ghost town, which was interestingly the first place to use alternating current electricity. 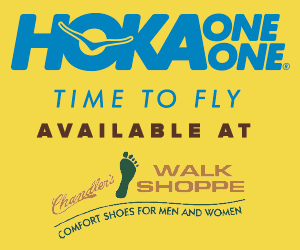 For an in-town, family-friendly adventure, rent a tube and paddle from Bootdoctors for just $15 and walk to Town Park. Hop on the river (with a beer in hand if you’re super coordinated) and float through a surprising amount of scream-worthy rapids in the 30-minute stretch. 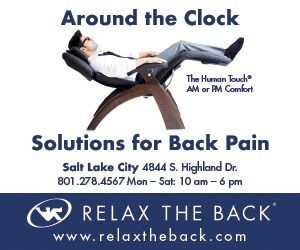 Lap it if you’re feeling confident about your tree-dodging abilities. After finishing the Via Ferrata. What I learned from climbing the Via Ferrata is that I’ll probably never ‘get over’ my fear of heights. Each time I think it’s tamed, it rises up and I have to reconquer it all over again. That said, I’m already scheduling a return trip to complete The Main Event again—with fewer expletives and more laughs next time. 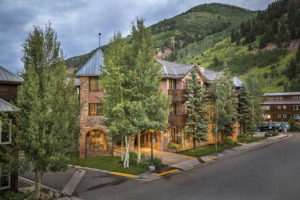 The Hotel Telluride is a 59-room boutique hotel within walking or cycling distance of nearly everything you’ll want to do in Telluride, a restored former mining town with a base elevation of 8,750 feet. 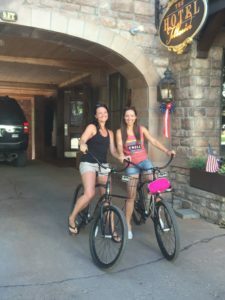 Free bikes at Hotel Telluride. 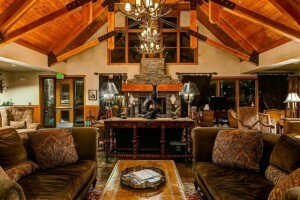 Stunning patio views, chef-prepared meals, by-request wine pairing dinners, outdoor hot tubs, pet-friendly facilities, Telluride Brewing Company, just three miles away. The Face Down Brown is a must-drink! Prepare to sweat as the bikes are gearless, and a few small hill climbs are involved. The Adventure High in Telluride Package available from The Hotel Telluride includes three-night stay, a guided climb on the Via Ferrata with San Juan Outdoor Adventures, technical climbing gear rental, gourmet packed lunch, daily breakfast for two at the hotel, altitude adjustment kit with natural remedies to help tame high altitude headaches, plus a one-hour glider ride with Telluride’s Glider Bob. 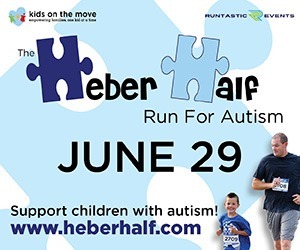 Prices start at $1,580 for two and the package is available until September 15, 2016.